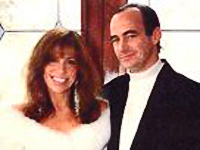 On Martha’s Vineyard, Carly Simon came around again and quietly wedded another writer named James on December 23, 1987. It took only a dozen minutes for two people who were strangers on a train only last spring to become husband and wife two days before Christmas. The setting was St. Andrew’s Episcopal church in Edgartown, Massachusetts, and the bride was singer Carly Simon, 42, who finally decided that was the way it should be and turned up to trade “I do’s” with writer James Hart, 37.